Our face is the first thing seen by other people, and most often they assume that it reflects how we feel on the inside. However, this is not always the case. As people age, the muscles and skin on the cheeks, jaw, and neck can begin to lose elasticity and sag. Eventually, the face may start to look tired, unhappy, and unhealthy. Unfortunately, extra sleep and fancy products cannot turn back the hands of time. The only way to restore a youthful look is through surgical intervention. The Rhytidectomy, more commonly referred to as a Face Lift, is an invasive procedure designed to lift the skin and muscles of the mid to lower face, which can become lax as the years go by. This loss of skin tone can be further complicated by smoking, sun damage, dramatic weight loss, and illness. A Rhytidectomy will lift sinking facial tissues and smooth the skin. The loose skin of the jowls, jawline, and neck will be made taut, resulting in a refreshed and rejuvenated appearance. Best of all, the Face Lift can provide long-lasting results. It is important to understand the Face Lift alone will not remove forehead wrinkles, Crow’s Feet, or the bags under the eyes. Used alone, the Face Lift will provide an excellent lift to the face and restore the healthy contours. When Face Lifts are performed in combination with other facial rejuvenation procedures, maximum aesthetic results can be obtained. For example, as the Rhytidectomy tightens the jawline, a Brow lift will smooth the forehead, the Blepharoplasty will tighten and lift the eyebrows, and Botox® or Dermal Fillers can ease the Frown line, Crow’s Feet, and depleted facial volume. By using these complementary procedures in conjunction with a Rhytidectomy, the total face will take on a more youthful appearance. The ideal candidate for a Face Lift in Chicago will be a man or woman in generally good health, looking to improve the sagging, aging skin on the lower half of the face. People with a defined bony structure, within 20 pounds of their target weight, can see exceptional benefits from the procedure. Patients should clearly understand the procedure and possess reasonable expectations for their upcoming surgery. Before scheduling a Rhytidectomy, a consultation with Chicago face list specialist Dr. Moynihan can be scheduled. At this time, he will perform a brief physical exam of the facial anatomy, review the medical history, and go over current medications. Dr. Moynihan will take some time to listen to each patient’s aesthetic desires and goals. Through Before and After photos of his previous Rhytidectomy patients, and using computer imagery, he will assist patients to visualize their potential results. At the initial appointment, Dr. Moynihan will explain the various contour Face Lift procedures in detail, any potential complications, and the expected recovery process for each. If it is determined that a Face Lift procedure is the right fit, an individual surgical plan will be created. It is at this time the exact cost of the procedure will be determined, payment options discussed, and the financing options reviewed. Dr. Moynihan performs his Face Lift procedures at a nearby, accredited hospital or day surgery center. The Mini-Face Lift is normally performed as an outpatient procedure, although depending on the extent of correction required, an overnight hospital stay may be recommended after the full Face Lift in Chicago. The Rhytidectomy is performed under general anesthesia or with IV sedation, taking between two and four hours to complete. To begin, Dr. Moynihan will make a thin incision, starting at the temple, running downward in front of the ear, wrapping around the earlobe, and stopping behind the ear. The incision is made inside of the hairline to conceal visible scarring. Once the incisions have been placed, Dr. Moynihan will separate the skin from the underlying tissues. He will then excise the unneeded skin and fatty tissue. Dr. Moynihan will reposition the remaining muscles and tighten the tissues. He will strategically place permanent sutures to hold the tissues in place. When the desired level of correction has been achieved, the incisions are closed with fine sutures and bandages applied. The Mini-Lift technique is reserved for the patient requiring only minor correction along the cheeks, jowls, and neckline. For this procedure, the surgeon will make three very short incisions: at the temples, the side of the face, and above the ear. Through these, Dr. Moynihan will insert a small scalpel, which is used to remove excess fat and skin. The tissues are pulled taut, and the incisions closed with sutures. A Mini Face Lift in Chicago takes about 90 minutes to complete, does not necessitate an overnight hospital stay, and only requires a two to three day recovery. Patients should expect their recovery after a Face Lift to last two to three weeks. Bruising and swelling should be expected for the first several days after surgery, although the swelling may take six months or longer to fully resolve. There may be a moderate level of discomfort. Dr. Moynihan will prescribe the necessary pain medications to keep patients comfortable during the healing process. It is not unusual for patients to experience some temporary numbness in areas of the skin and face; this will dissipate over the upcoming weeks. Depending on the extent of the Face Lift, the head may be wrapped in surgical gauze, bandages, and/or a compression garment. These will help control swelling and hold the tissue in position as it begins to heal. Dr. Moynihan will closely monitor the progression of healing, with the first follow-up appointment scheduled five to 10 days after surgery. Here he will also remove sutures and change dressings. Patients normally feel well enough to return to work or school 10 to 14 days after surgery. After this time, women and men are generally comfortable in their appearance, and ready to be out in public. Lifting and vigorous exercise should be postponed until four to six weeks after the Rhytidectomy. While the recovery from good Face Lifts will only take a few weeks, it will take longer before the final results can be appreciated. Once the swelling has completely resolved, the appearance will look tighter, more sculpted, and years younger. Scarring does occur after a Face Lift. Dr. Moynihan meticulously places his incisions within the natural hairline, to keep these scars hidden. Dr. Moynihan is one of the top Rhytidectomy providers in the country. The innovative techniques he uses will guarantee the best Face Lift results, with the shortest recovery and lowest chance of complications available today. Although problems after a Rhytidectomy are rare, it is a major surgery, so there is a small risk for complications. These include bleeding, scarring, infection, loss of facial sensation, and asymmetry of the face. To avoid these complications, it is very important that patients select the best plastic surgeon available. Dr. Moynihan’s experience and skill set make the Rhytidectomy at Gold Coast Plastic Surgery a safe and efficient procedure. The exact cost of the Face Lift procedure will depend on the patient’s anatomy, the techniques used, and the extent of correction required. At the consultation appointment, Dr. Moynihan will determine the precise cost of a patient’s upcoming Rhytidectomy. Detailed information on payment plans and financing will be discussed at this time, as well. Gold Coast Plastic Surgery is located in the heart of Chicago. We have been performing the Face Lift procedure for over 10 years, and Dr. Moynihan is considered a leader in innovative cosmetic surgery techniques. If you would like more information on the Face Lift procedure, or would like to schedule a consultation with Dr. Moynihan, contact our office at (312) 988-9300. We can provide travel assistance for patients who are traveling from out of town, so please let us know if specific help is needed. The Face Lift, also known as a Rhytidectomy, is a surgical procedure designed to improve the appearance by eliminating the lax skin, heavy jowls, and sagging neck tissue that results from the aging process. What areas can be improved through a Face Lift or Mini-Lift? A Face Lift will address the lower 1/3 of the face and neck, primarily from the lower cheeks down to the neck area. A Mini-Lift treats the cheek area alone. Who is a good candidate for a Face Lift or Mini-Lift? The ideal patient for a Face Lift or Mini-Lift will be in generally good health, preferably within 20 pounds of their goals weight, and looking to improve sagging tissue along the lower face and neck. The procedure can benefit patients of any age, as well as both men and women. Dr. Moynihan begins the Face Lift procedure by making a thin incision at the hairline, immediately above the temples. This will extend across the scalp to end in the hairline behind the ears. From here, he will lift and reshape the tissues of the face, providing a more youthful appearance. 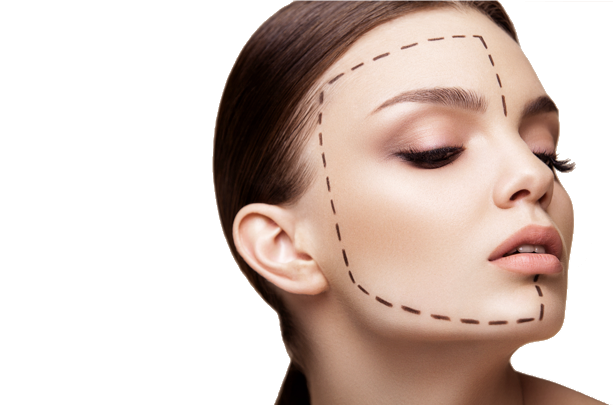 Where are the incisions placed for the Face Lift or Mini-Lift? Dr. Moynihan places the Face Lift incisions behind the hairline along the scalp and behind the ear. When working on the neck region, the incisions are placed under the chin. As a result, scars are well concealed within the natural anatomy. The Mini-Lift uses extremely small incisions along the scalp and behind the ear, which are also hidden within the hairline. What type of anesthesia is used during a Face Lift? The Face Lift procedure is performed under IV or general anesthesia. How long does a Face Lift take? Depending on the type of Face Lift, and extent of correction, the procedure will take between three to four hours to complete. What should I expect immediately after a Face Lift procedure? A compressive dressing will be placed around the cheeks and under the chin the first night following a Face Lift. Patients are given instructions on how to remove these dressings and clean the incisions the next day. Seven days after the Face Lift, sutures and clips are removed. Another follow-up appointment, at the two-week mark, will remove one final suture by each earlobe. Dr. Moynihan will closely monitor the recovery progression during this time. If healing is going well, postoperative appointments are then scheduled for six weeks, three months, six months, and one year. What can I expect from the extended Face Lift recovery? Patients should expect the recovery after a Face Lift to take about two weeks. Initially, swelling and bruising will occur, although most of this will diminish over two to three weeks. Temporary numbness and tightness may be noticeable, as well. Minor discomfort may be experienced over the first few days, but Dr. Moynihan will prescribe appropriate pain medications to keep patients resting comfortably at home. When can I return to work after a Face Lift? Generally, patients feel and look well enough to return to work 10-14 days after their Rhytidectomy procedure. Strenuous activities should be postponed for the first four to six weeks. What procedures are commonly used with the Face Lift? To provide maximum facial rejuvenation results, a Chin Implant may be used with a Face Lift to enhance the facial structure. To smooth and even nasolabial folds (creases from the nose to the edges of the mouth), facial fillers, such as Juvederm®, work well with the Face Lift procedure. Both combinations will provide natural, organic looking results. What are the risks associated with a Face Lift? Modern Face Lift techniques used at Gold Coast Plastic Surgery make the procedure safe and efficient. Since it is a surgical procedure, there are still risks involved. These can include excessive bleeding, infection, delayed wound healing, and nerve injury. Those with diabetes mellitus, chronic illness, or use tobacco productions may encounter the additional risk of poor wound healing. For this reason, Dr. Moynihan may choose to treat these patients with a more conservative technique. Will there be scarring after my Face Lift procedure? The Face Lift procedure does result in visible scarring. These will be well concealed within the natural hairline, though, thus making the scars almost unnoticeable. How much will my Face Lift cost? The exact cost of a Face Lift will depend on the technique used and the level of correction required. Dr. Moynihan will determine the cost of an upcoming Face Lift procedure at the consultation appointment. Can I finance my Face Lift? Patients have the option to pay with cash, all major credit cards, or with medical financing through CareCredit. At your consultation with Chicago face lift specialist Dr. Moynihan, the exact cost of an upcoming Face Lift procedure will be discussed, as well as all available payment options.